After Dodge has focused on air flow in teaser images for the 2019 Challenger and 2019 Charger in Hellcat trim, I have to wonder if this focus on air flow might be a hint to more horsepower for the new model year – possibly numbers that will rival the new Corvette ZR1 and the upcoming Ford Shelby GT500 Mustang. 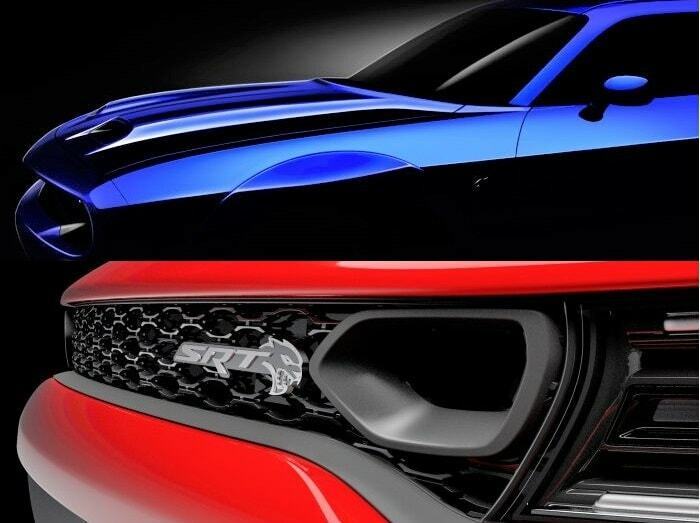 Earlier this month, Dodge teased the 2019 Challenger SRT Hellcat Widebody and the 2019 Charger SRT Hellcat. For the coupe, we learned that there will be a new dual-intake hood scoop design while the sedan gets new vents in the grille. We don’t know for sure that these are performance changes and not just aesthetic upgrades for the new model year, but it seems that with these two teasers, Dodge is focusing on air flow. Of course, air flow is what makes the Hellcat cars so amazing, with the IHI supercharger cramming tons of air into the 6.2-liter Hemi, where it meets the fuel to make gobs of power. When you add more air, you can add more fuel and make more power, so while there has been no word from FCA about new power numbers for the new model year, the company is definitely focusing on air flow with their first teasers of the 2019 Hellcat Challenger and Charger. A great many people will look at the fact that the Hellcat Challenger and Charger offer 707 horsepower and 650 lb-ft of torque and immediately question why someone would need that much power. Those same people undoubtedly believe that there is no reason for the 2019 models to “need” even more power, but in the ongoing horsepower war – Dodge might be looking to stay at the head of the class. Well, technically, Dodge is the undisputed leader in the horsepower war with the 840-horsepower Challenger SRT Demon, but that is a limited production car which will not be offered for 2019, so the head of the Dodge attack are the Hellcat cars. When the Hellcat cars were introduced for the 2015 model year, their ratings of 707 horsepower and 650 lb-ft of torque were well above any American competition. The 2014 Mustang GT500 had 662 horsepower, but it went out of production around the same time that the Hellcats hit the street. The most powerful Corvette at the time of the Hellcat arrival was the Stingray, but even when the C7 Z06 debuted with 650 horsepower, the Hellcat cars were still at the top of the American horsepower list. However, with the introduction of the 755-horsepower C7 Corvette ZR1, the Hellcat Challenger and Charger are no longer the most powerful American road cars (again, not factoring in the Demon as we head into the 2019 model year). It can be pointed out that the ZR1 is in an entirely different class, so the Hellcat cars are still the most powerful models in their segments by a comfortable margin, but that could soon change with the arrival of the new Ford Mustang Shelby GT500. Ford has promised that the new GT500 will have at least 700 horsepower and hopeful Blue Oval fans believe that it could offer 772 supercharged horsepower, but so long as it offers more than 707 horsepower – the new Mustang will surpass the Hellcat Challenger for the title of the most powerful muscle car. The Hellcat Charger is likely to remain unchallenged in the high performance sedan segment within the three American automakers. When an automaker builds a sedan that has more than 707 horsepower, it will almost surely come from a European company, but for now, the Charger has no real competition. With the Hellcat cars being surpassed by the new Corvette ZR1 and the new Ford GT500 Mustang, Dodge may want to reclaim the title of the most powerful American production car and that is why the 2019 Hellcats “need” more power. We know that Dodge can get 808 horsepower from the 6.2-liter Hemi on 93-octane gasoline with the 2.7-liter supercharger from the Demon, but I truly don’t believe that the company is going to get so close to their limited edition 9-second muscle car. On the other hand, using some components from that 808-horsepower engine should allow the engineers to get the engine of the Hellcat cars up past the 755-horsepower mark, thus allowing them to outgun the new ZR1. If the new GT500 comes out with 772 horsepower, it seems possible for Dodge to build the Hellcat up into the higher 700-horsepower range as well. We know from the teasers that Dodge is focusing on air flow, but we don’t actually know for sure if the new hood of the Challenger and the new grille of the Charger actually offer more air flow, or if they are purely appearance upgrades. Hellcat Charger owners have pointed out that their supercharged sedans already have some plumbing behind the grille – they just don’t have that accentuated opening in the grille. As for the Hellcat Challenger, we know that the restyled hood for 2019 has an extra front-facing hood scoop, but we don’t know for sure that the new design really brings in more air than the current Hellcat hood, or if the redesign is just a fresh look. While a fresh look will lead to more sales, there is no question that added air flow to feed a higher performance engine will make the 2019 Hellcat Challenger and Charger even more enticing to prospective buyers. Let’s hope that more power is on the horizon as the modern American horsepower war just keeps on getting more exciting.